Software development has gone mobile. We see a large audience using smartphones and tablets, and as developers/marketers/entrepreneurs we want in. When planning such a project there are myriad decisions. The choice of target platform (e.g. iOS) and target device (e.g. iPad2) is a primary consideration. Apple’s iOS hits the majority of the market but with time others will mature and may offer more competition. Moreover to hit your market you may be best served to offer your software to more than one platform and more than one device-per-platform. Quite quickly a rather conservative project can target 5-10 unique pieces of hand-held hardware. Each device offers unique features. The market-penetration, platform, processor-speed, input-capabilities, screen-size, and other factors are all important. Two major form-factor camps are ‘phone’ size and ‘tablet’ size. There is some overlap between these categories such as the Samsung Galaxy 1000. Free – To gain experience and reputation. Freemium – Offer a free version and market within the experience for a pay-version with more features. Ads – Integrate video ads, animated ads, or still ads into the experience. Micro-transactions – Offer bite-sized purchase opportunities which enhance the experience. a) Native App Development – This means you use the 1st-party language (and tools) offered by the platform creators. This means using XCode tool with Cocoa framework coded with the Objective-C language when developing for iOS. Native development generally offers the very best potential performance (i.e. for high-end gaming) and tightest integration to the devices (e.g. detect battery level, etc…) and OS/marketplaces (e.g. iOS in-app-purchase). b) Non-Native App Development – Many 3rd parties offer code libraries and tools to ‘speed up development’. Some of these are in the native language and some are not. Some of these non-native solutions offer the ability to ‘code once (so to speak) and deploy to multiple platforms’. c) Mobile Web Development – Instead of a standalone application, an experience can be made available via web-browser and development to fit the size of the target (mobile) device(s). With HTML5 much is possible, but in general this is used for less-expressive less-device-specific experiences. It can also be a very inexpensive way to ‘break into mobile’, as you can use assets/code from your existing website.. While the ability to develop one project for multiple platforms offers many advantages in saved development time and ease in maintenance, it also offers many challenges. Designing a compelling application that takes advantage of the unique features of each device and looks polished on the dizzying array of screen sizes out there can be daunting. For Flash-To-Mobile there are many resources on Adobe’s Mobile Devnet to help you learn the basics. It is possible for an application to be self contained, including all data/assets with the original install. This is common for games. However many projects require internet connectivity. 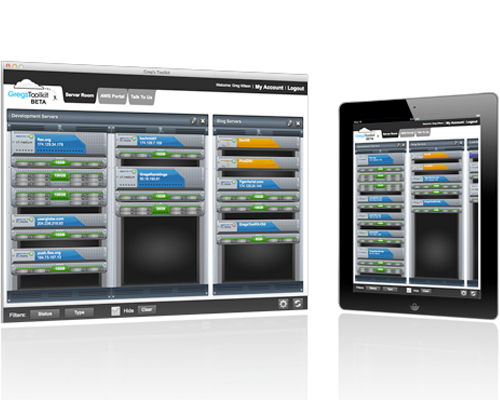 The data/assets loaded can reside on existing servers outside of your control, or can reside on your own servers. Custom backend solutions using typical backend languages (c++, Java, PHP, Python, etc…) may also be required. All of this depends on your particular project. In general any of the development-paths can contact any of these backend solutions, but some may connect more easily than others. Let’s assume you have a great new game and want to capture a ‘big audience’ with ‘modest investment’. If the application does not require deep-device-integration a recommended choice is to target both iOS (iPad1/iPad2, iPhone3G/iTouch3G, iPhone4G/iTouch4G) and Android (various devices). If your team has Flash expertise the Flash-To-Mobile publish path may be ideal. With Flash CS6 and more-so Flash Builder 4.6, Flash/Flex developers can publish ONE codebase to MULTIPLE platforms. 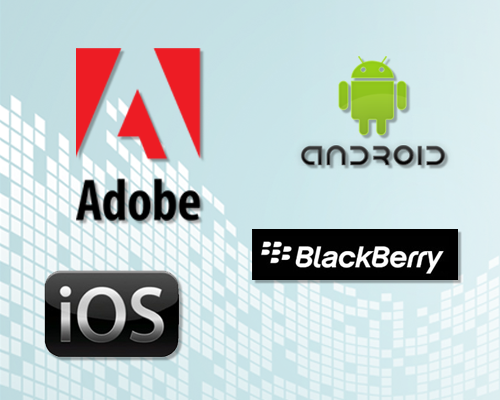 Using Adobe’s AIR 2.7 (latest public release) you can develop many platforms & Devices. Compatible Target Platform/Devices: Web-Browser (Mac+Windows+Linux+Non-iOS Mobile Browsers), Desktop (Mac+Windows+Linux), iOS (Ipad1+Ipad2, iPhone+iTouch 3rd Generation, iPhone+iTouch 4rd Generation-Retina), Android (Myriad Devices), Blackberry Tablet OS (Blackberry Tablet). Supported Flash-To-Mobile Device-Specific Features: Flash-To-Mobile does offer view-persistance, data-persistance, video playback, still-camera capture, still-camera-roll save/load, internet access, in-app web-browsing, accelerometer/gyroscope, Microphone, Geolocation, Multitouch, File-system access. Not all devices offer the same features. In the future ‘Native Extensions’ (see below) offer a solution. Project Setup: A recommended options is one bulky Flex Library with (most) all code and assets, and then one Flex Project *PER PLATFORM*. You add/edit to the library and publish each of the projects as needed. You can test with an mobile-emulator (fastest) window that appears on your computer, or on the device via USB (best to test hardware features like accelerometer. The ‘flash’ code is converted to ‘native code’ (so to speak) before deployment. Deployment: Upon completion the platform-specific file is uploaded to the platform-specific marketplace (e.g. iTunes’ App Store for iOS). A Flash-to-Mobile project sits along-side native applications. Ostensibly users have no idea the application was developed with non-native tools. The marketplaces do not delineate this or otherwise make that info available in any way to users. The end-user experience can be indistinguishable from a native app (project type and project polish depending). In light of the ‘Device-Specific’ features listed above, Flash-to-mobile currently leaves us without everything we may want to do (e.g. iOS in-app-purchase). The yet unreleased (release date is ‘early October 2011’) Adobe AIR 3.0 will include ‘Native Extensions’. In short, this allows for *ANY* Flash-to-mobile project to access *ANY* feature on *ANY* supported device (Android / iOS / Blackberry Tablet). Developer will require knowledge of both AS3 (flash) as well as the Native language(s) on the target device(s) to add new features. Or your team can find free and premium extensions which the community could share. This is not just for mobile, this technology will also allow AIR on desktop computers and AIR on TV’s to integrate with those devices too. AIR 2.6 (Available in Full Release) – Commonly in use today. AIR 3.0 (Available in Public Beta Now) – Offering Native Extensions and more. Some of what is coming in the future is listed below.. This may or may not all be included in the very-next tools. Recently Adobe has announced What’s new in Flex 4.6 SDK and Flash Builder 4.6. This future feature will ostensibly allow Flash-To-Mobile projects to access *ANY* feature on *ANY* targeted device (e.g. in-app-purchase on iOS). Adobe AIR 3.0 Native Extension – Explained! Stage3D (Formerly codenamed ‘Molehill’) is a set of API’s available in the future that will ostensibly allow Flash Browser projects (using Flash Player 11) and Flash-To-Mobile projects (using Adobe AIR 3.0) to show high-grade hardware rendered 3D. Finally, the Flash Platform can truly compete as a 3D gaming engine. The same API (despite the name) can also be used for radically improved 2D gaming performance too. NOTE: These API’s are low-level and challenging to understand. 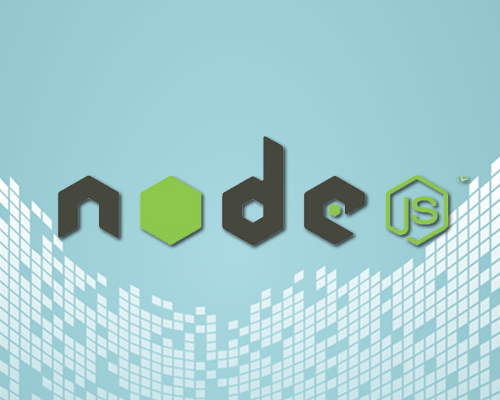 We expect 3rd parties will wrap this functionality with easy-to-use API’s for free/premium use. Unreal Releases ‘Citadel’ – The first interactive demo of UNREAL engine running in Flash Player. So with AIR 3.2 (See Adobe Press Release) we can use Stage3D for mobile. This means GPU-Accelerated graphics on iOS/Android. I think there is a marketable benefit on getting the Flash Player to compete against other 3D gaming solutions (such as Unity3D) and perhaps compete less with emerging 2D gaming solutions (such as HTML5 gaming) so I can sympathize with Adobe’s (better late than never) focus on 3D for Flash. This article “Why Starling (or any other 2D framework on top of Stage3D)?” explains some really good reasoning. Spaced Away is the first game in the iOS app store to feature Stage3D by developers Falanxia. Regardless of why, Stage3D is here, and Starling’s power lies in how it uses the Stage3D – first available in Flash 11 and AIR 3.0. Stage3D is designed for GPU accelerated 3D. While its possible to use the Stage3D API’s directly, it is very difficult. There are 3D frameworks for AS3 , but for many game developers we can exploit its power for 2D gaming. That’s why Starling focuses purely on 2D. So an API like Starling helps developers make great content – quickly. Falanxia brings its FWA Award –winning space physics puzzle game to both iPad and your web browser. Join your friends on Facebook to take out Rovio’s famous pigs with enhanced special effects. Waste Creative’s tech demo lets you blast aliens at a silky smooth 60 fps, across browsers and iPad, with Stage3D. Angry Birds is a strategy puzzle mobile game developed by Finnish computer game developer Rovio Mobile. Inspired primarily by a sketch of stylized wingless birds, the game was first developed for Apple’s iOS in December 2009. The game was immediately very popular. The game is now readily available for most every tablet and smartphone. The game play in Angry Birds (AB) is simple, physics based fun. It inspired dozens of clones – games which copy the signature control-scheme and style of the original. It is generally considered to be the most successful mobile game to-date. 23 -Months it took for the game to reach the 500-million-download milestone. It was first released for Apple’s iOS in December 2009. There is a feature film version of the game in development too. So when porting a popular brand from one platform/language to another typically you look at the developer community and the players communities. There are developers using a wide variety of technologies, and web browsers offer several options for gaming. Since the game is (relatively) simple in 2D graphics and physics – two major choices are HTML5  and Flash[2, 3]. I assume (and am too lazy to research further) the Google Angry Birds version is some type of sponsored collaboration between Rovio and Google. 2. In Fall, 2011, Adobe’s MAX Conference debuted a version (See Video) of Angry Birds using Flash. Obviously a huge software tooling company and creators of a huge game have many reasons to team up. I assume (and am too lazy to research further) the Adobe Angry Birds version is some type of sponsored collaboration between Rovio and Adobe. As an FYI, As of February 2012, both of these versions are still showing ‘BETA’ in their logo. 3. Now we come to the Facebook version. The tremendous audience of FB matched with the popularity of AB will surely bolster both brands and provide a valuable, social experience for users. On Valentines Day 2012, the Facebook, Flash version of AB launched and uses Flash Player 11’s “Stage3D” feature to render its fast accelerated 2D graphics. The project plays really smoothly and introduces some decent social game play. 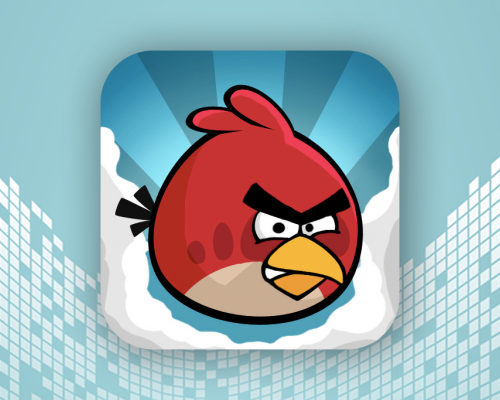 Rovio launched Angry Birds for Facebook using Flash Player 11 with support for 3D graphics. The most social version of Angry Birds yet takes advantage of hardware accelerated graphics in Flash Player to bring a silky smooth gaming experience to a wider audience than ever before. More than 130 million people play Angry Birds every day – now with Flash Player, hundreds of millions of Facebook users can do the same. New, enhanced special effects like lighting, smoke and explosions running smoothly at 60 frames per second bring the game to a whole new level and allow players to have a more connected and engaging experience. Angry Birds on Facebook game makes it even more exciting to play with friends, offering amazing new power-ups like Sling Scope, Birdquake, King Sling and Super Seed to extend players’ gratifying arsenals. As a game player I think Angry Birds is good. Do I play it? Not much. Like many mainstream ideas from the perspective of a die-hard game player, I think its just good, not great. Part of this is evident when you look at the big budget titles that copy the exact gameplay and fail miserably. Angry Birds is a good game that came out at the right time and was very lucky for it. Its popularity brings it more popularity and for that its #1. I cannot argue with its success. It’s phenomenal. Any game developers would be happy to have this game in their portfolio. To now have the game on Facebook, that is great too. Starling Extension – Dynamic Texture Atlas – Finally Vector Graphics in Starling! 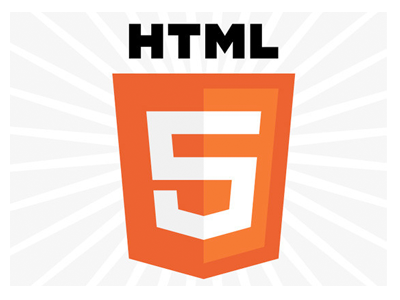 I’m excited for HTML5, for app development and gaming and have written a bunch about it. Flyer Game for HTML5 (Same game in 8 different Frameworks) Full Source-Code Included. Here at Rivello Multimedia Development, we design and program with a variety of popular platforms. Contact us today with your game and app project ideas. In a recent article I overview the major community/commercial projects in HTML5 for HTML5 Game Frameworks as well as HTML5 App Frameworks. 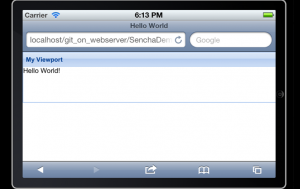 One of the app frameworks I listed there is the Sencha Ext JS 4 Application Development Framework. This post serves as a tutorial to get you started. The full source code and 3 HD Screencast Video are available far below. For general questions. please comment below. For RMC’s Consulting services, please contact us today! 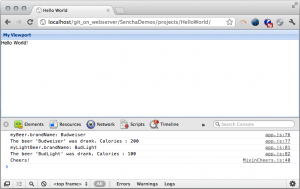 Before you follow along with this tutorial you’ll need to setup the development environment for Sencha. This includes a web browser, a web server, and a text editor (or code IDE). I’m using a Mac Computer w/ Chrome Browser, Mac Web Server, and Komodo Edit. I’m new to Komodo Edit and cannot yet recommend it. Follow the setup instructions here in the Sencha Getting Started docs. Typically a Hello World program illustrates the quickest way to get anything (such as text) onto the screen and publishing (or compiling) without errors. In this post I have also added a few things. We see a Sencha component (Viewport), Sencha classpathing (src), a custom super class, a custom subclass, and an example of a mixin class (which allows for something like multiple inheritance). Here is the example running. 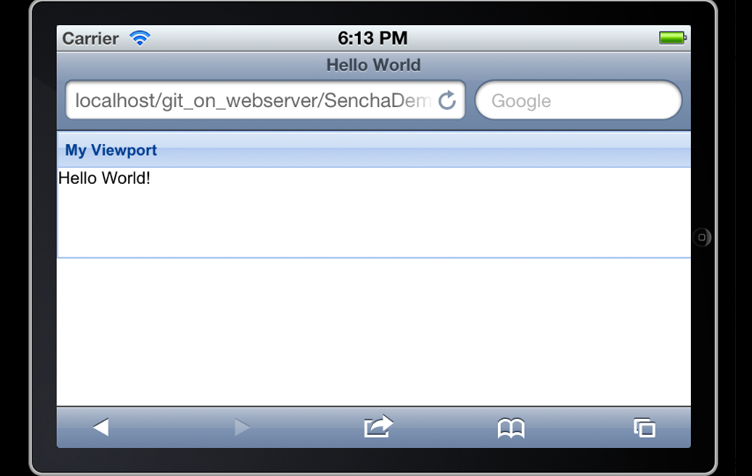 I show it running in both Desktop browser and iOS (through an emulator I have – provided by Apple, not Sencha). 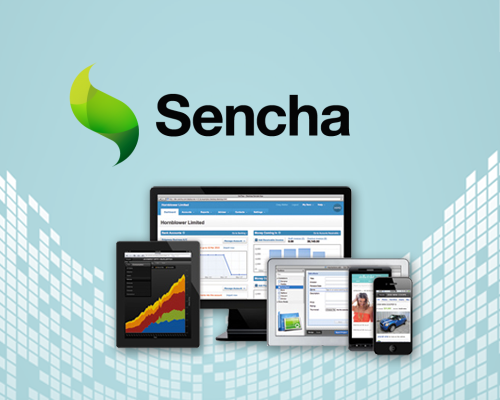 Sencha also offers a ‘Sencha Touch’ library that is built specifically for mobile. I’m NOT using that here. I’m just using the mobile browser to show (not-specifically-mobile) HTML5 content. Works pretty good. Debugging: In the chrome window, its clear that the bottom is using Chrome’s Built-In View->Developer->Developer’s Tools which Sencha outputs to very nicely. You can see the index.html loads 3 external files. I’m using the default CSS I found in some basic tutorials. I have not yet added/edited any styles. In the future I’ll study more on what’s possible. There are a few choices that ExtJS gives you out of the box, each with their own distinct advantages or disadvantages. You only need to use one. Here is a rundown of each of the files. ext-all-debug-w-comments.js – Debug version of the entire framework, with comments. This is the largest file of the bunch and requires the most processing to display in browsers. ext-all-debug.js – Same as above, but without the comments. Still very large, but very good for debugging in most cases. ext-all.js – The entire framework concatenated and minified. Debugging is impossible with this file, so it should be used for production systems only. ext-debug.js – This file contains the Ext JS foundation and white-space. With this file, you can remote load all of Ext JS as needed, and it provides the best debugging experience. The tradeoff is that it’s the slowest. ext.js – The minified version of ext-debug.js. 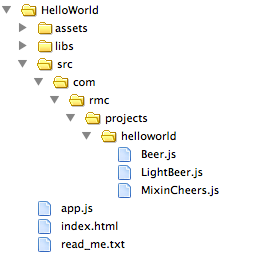 The app.js file is the entry point for your custom code. It is where you put all your custom stuff as well as the ‘src’ folder and the ‘assets’ folder. I have not dug deep into Senchas Component library but DAMN there are many good looking components. There are components for Accessibility, Grids, Charts, Tabs, Windows, Trees, Layout, Managers, Drawing, Drag and Drop, Toolbars, Menus, ComboBox, DataView, Forms, MVC, and more! Here is a simple example of a ViewPort (basically a 100% 100% canvas within-which you can put panels or other things). Sencha has a nice way to separate your code into classes and your classes into packages. The root of all your packages is your source folder or your ‘classpath’ in Adobe Flex parlance – if you are familiar with that. Classes/packages help greatly with both organization and debugging (breakpoints and errors show you (more) clearly where the problem is). //      at the physical location "src.com.blah.foo"
Here is the super class. Here is a subclass which extends that super class. Here is a mixin class which the subclass uses. If you enjoyed (and understood) the ‘Hello World’ example above, here is something more advanced for you. 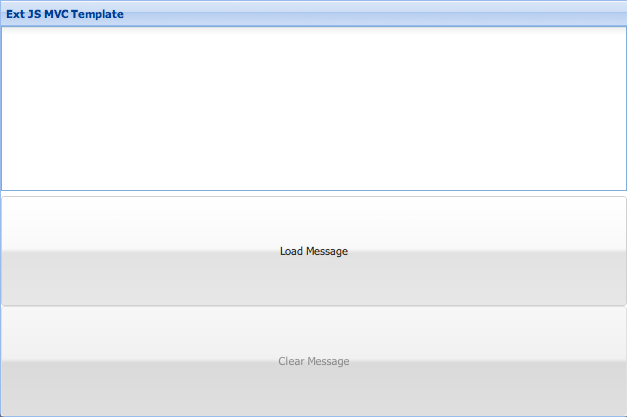 In the spirit of the Robotlegs MVC Templates I created for AS3/Flex projects, I created an ExtJS MVC Template. 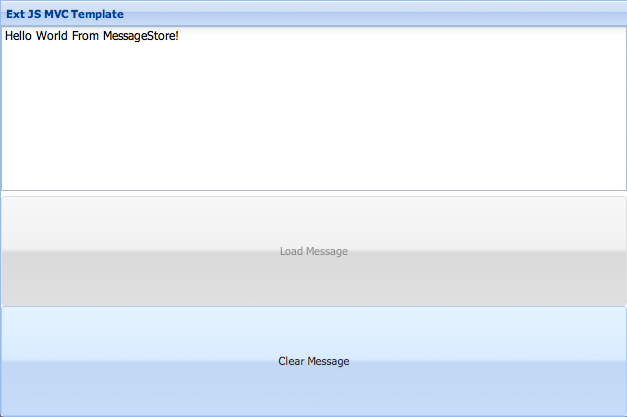 The idea of the template is to create (and later evolve slightly) a polished, simple example of an MVC app. This can serve as a starting point for all new ExtJS projects. MVC is a popular methodology to separate the model (data), view (user interface stuff), and controller (the ‘what’ that happens when you click UI and stuff). The app features a simple ui with ‘load’ and ‘clear’ buttons. The load (See ‘Figure 1’) button from the view communicates to the controller which loads data from the model into the view. Clear works in a similar way (See ‘Figure 2’). Its very basic, but illustrates some key concepts about Sencha. Checkout the full source code and 3 HD Screencast Videos (See ‘Member Resources’ below). As part of my evaluation of HTML5 App Frameworks, I need to look at some other frameworks before I give an educated opinion. 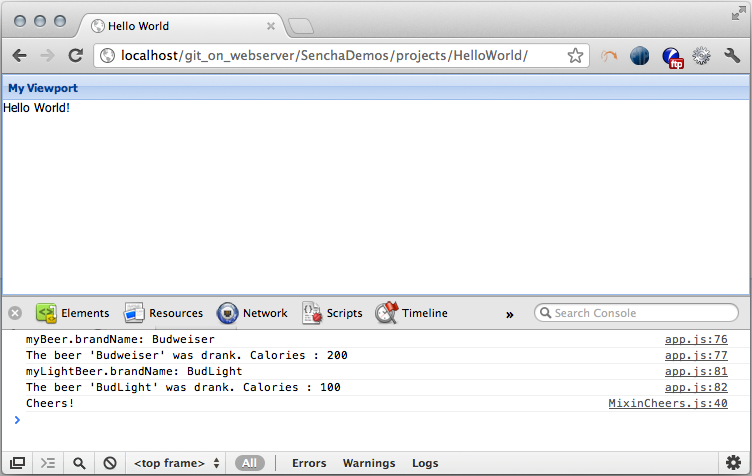 However, I’m happy with what I see in Sencha. The language looks good, the styling appears to be very flexible and robust, and the components (from a user’s perspective) look and feel great. Some things I’d like to do next; I may try to make a blog reader app to load xml, parse it and populate a data grid as a future project with Sencha. I’d like to create a more complex OOP example which includes private/public members and fires events. All of which I know how to do, but have not documented yet. I’d also like to create a Sencha Touch demo or 2, which I think will be 99% identical code, but more suited for running on mobile as an app rather than the demos above which are for web browsers. For general questions. please comment below. Thanks! For RMC’s Consulting services, please contact us today! Download the full source code to all projects mentioned in this post. HTML5 allows for great in-browser app development. Recently, I wrote a few Great HTML5 games and on the Pros and Cons of HTML5 for gaming. Overall, the potential is high, but issues with browser compatibility, immature tools, and lack of elegant OOP and architecture will slow the progress of HTML5 for gaming. 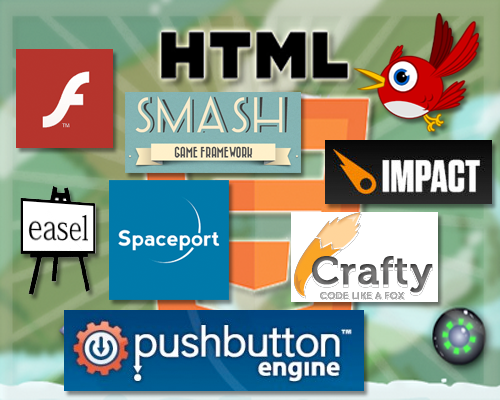 For HTML5, I’ve found many frameworks to support application development in the browser. Many also have IDEs to help development and other (non-browser) publishing paths such as iOS/Android. We probably all forget that HTML5 means “Hyper Text Markup Language”. Its a formatting language that allows for linking (hyper). Version 5 is here, but will not be finalized for a few years (2014?). So what is version 5 and why are people so excited? Well, ‘HTML5’ technology is really a combination of 3 key technologies. All are free to use, standardized, and far more powerful than previous versions. So people are excited. Also many people are using mobile to access the web. And mobile web usage is increasing really fast. *AND* because mobile browser was created more recently (and thus not limited by historic limitations in computers and the related bureaucracy, *much* mobile web browsing TODAY is compatible with HTML5. All good things. Above HTML5+JS+CSS, a framework adds a consistent library of actions, events, and UI. We generally hope that a framework can be powerful to meet our needs, fast to meet our development deadlines, and flexible to allow us to customize and extend the framework to meet our particular needs and fringe cases. HTML5 Game Framework– High-level and game specific. This is ONLY good for game development. Runs in an HTML5-enabled browser. See this awesome post Flyer Game for HTMl5. HTML5 Mobile Framework– This is generally an ‘app’ framework PLUS it may allow you to publish to ‘native’ device languages and handle finger ‘touch’ events, accelerometer and other mobiles-specific features. HTML5 Resource Guide of links to simple starter templates. I wanted to test out a few frameworks for HTML5 to learn more. Check back soon for a review of the best frameworks. 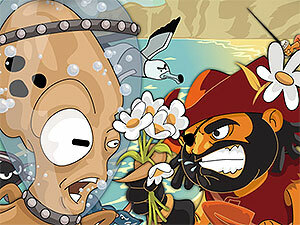 HTML5’s canvas tag allows for great in-browser gaming. 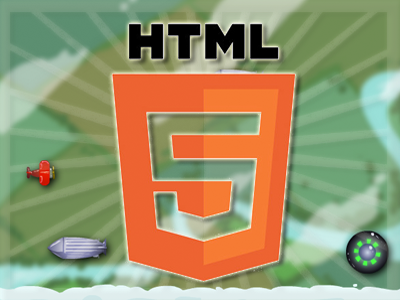 Recently, I’ve posted a few Great HTML5 games and on the Pros and Cons of HTML5 for gaming. Overall, the potential is high, but issues with browser compatibility, immature tools, and lack of elegant OOP and architecture will slow the progress of HTML5 for gaming. I haven’t recoded all of those (yet), but many are ready for you. Check them out! The ‘Flash Killer’ HTML has some impressive demos. I see a long future for both technologies. More on my 2-cents later. For now checkout some cool demos. While I’m far too young to remember 8-bit gaming in the 1980s, Biolab is a homage to those simpler but addictive titles from 20-30 years ago. 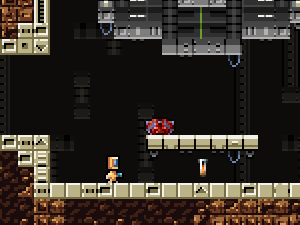 The game is a space-themed platformer with colorful chunky sprites, great animation and sound effects. The developer, Dominic Szablewski, has also released the canvas-based library at ImpactJS.com. Biolab is a fine game. In fact, it’s better than many released in the 80s so I’ve heard. 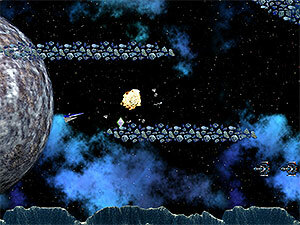 Crystal Galaxy is a sideways scrolling space shooter reminiscent of R-Type. However, the game’s unique in that the mouse controls the direction of the ship as well as its location. Unusually, Crystal Galaxy doesn’t use the HTML5 canvas element. Every sprite is an individual HTML div moved around the screen. It works quickly in all browsers and is even playable in IE6! The authors at EffectGames.com also provide free tools and libraries to help you write your own titles. Crystal Galaxy is fun, and you won’t be able to resist another go. As you might expect, Canvas Rider is a version of Line Rider implemented using the HTML5 canvas element. 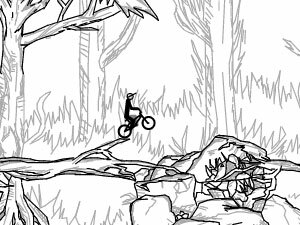 The game is simple: you ride a bicycle over a series of obstacles to reach a goal – but the realistic gravity and physics make it a serious challenge. What makes Canvas Rider more special is the online track editor and the thousands of tracks submitted by fans of the game. Agent 008 Ball is a glorious-looking game of pool for one player. 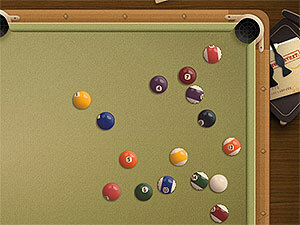 The objective is to pot as many balls as possible before the timer runs out. Again, Agent 008 Ball uses the HTML5 canvas element, but it’s the photo-realistic graphics and real-world physics make the game stand out.